It’s one thing to start a sentence with, “my good friend, Cher.” It’s another to follow up with, “my good friend, Amy Schumer.” And it’s yet another to find room in between for the phrase, “my friend, Tony and Emmy Award-winning star Kristin Chenoweth.” Few could get away with that kind of name-dropping without getting smacked. Even fewer would develop that habit into a quirky persona that fans not only delight in but happily watch on TV and pay to see in concert. For more than 30 years, Kathy Griffin has been serving celebrity dish in a comical way. When she, herself, became a D-List star, she added her own anecdotes about run-ins with the rich and famous. That mix of snark and look-who-I’m-talking-to giddiness, combined with Griffin’s natural garrulousness have led to two Grammys, two Emmys, three TV series with her “name in the title,” a standing gig on New Year’s Eve, and a non-stop career turning her life into comedy. In fact, when we talk, Griffin is in the midst of an 80-city tour, bringing her brand of comedy to places as far flung Grand Rapids and Cozumel. (She reaches exotic Flushing and Brooklyn in April.) Like her “late, great friend, Joan Rivers,” Griffin has workaholic habits, so squeezing in a half-phone interview for Long Island Woman was both a nice gesture on her part but also par for the course for a reality-TV veteran who knows that these days, staying on top means staying relentlessly visible, anywhere and everywhere. Of course, for Griffin, it also means that an interview isn’t so much a conversation as a monologue with momentary interruptions—and that’s just fine by us. LI WOMAN: This being a Long Island magazine, do you have any special memories here? 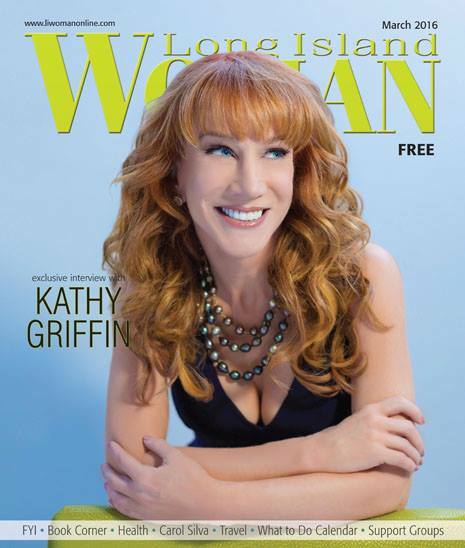 KATHY GRIFFIN: I’ve played many, many venues on Long Island. I’ve played Hofstra University—that’s on Long Island, right? Rosie O’Donnell came because her son is attending Hofstra, and my friend—Tony and Emmy Award-winning star Kristin Chenoweth—came. And it was funny because to see me do a college gig is very different from Carnegie Hall or The Mirage in Las Vegas or a performing-arts center. I kept saying to Rosie and Cheno, “Are you sure you wanna come see me in a college? I think I’m performing in, like, the basketball court with folding chairs and stuff!” My dressing room was a locker room. Yet we had so much fun. We took Twitpics and Instagrammed. LIW: Do you have to change your material and approach for the college crowd? GRIFFIN: Of course. You’ve gotta talk about the topics they’re into. In fact, tonight—don’t laugh—I’m gonna go see One Direction because when I play colleges, I have to be up on that stuff. And I’ve had a wonderful run-in with, as I call him, my Harry Styles. The college audience members know all about One Direction, Five Seconds of Summer, The Weeknd [sic]—and so tonight I’m actually going to a multi-concert, including Selena Gomez. I have a backstage pass. Obviously, I’m a music fan, but if I end up getting a little run-in or a moment with Selena Gomez or Harry Styles, of course I will bring it to the stage. LIW: But are you even able to have a “real” moment with all these famous friends and acquaintances, or does it all just become potential fodder for your act? GRIFFIN: I’m gonna be honest: it’s always “this might be fodder.” The real moments are more like the accidental ones that happen. But if I’m going to go backstage at a concert and hope to say hi to Selena Gomez—whom I have met several times; she’s very nice—of course, I’m secretly hoping that I’ll witness something crazy, and that’s what I like to bring to my “Like a Boss” tour. I’m not just gonna talk about Donald Trump, `cause anybody can make a Donald Trump joke. I’m gonna talk about the time Donald Trump was driving Liza Minnelli and me in a golf cart on this golf course—which, by the way, might be on Long Island; does he have one out there?—so what I try to do in my specials and on my live tour is material that is my own personal stories with these folks, whether it’s some freaky reality star or a living legend like Gloria Vanderbilt or Gloria Steinem or Don Rickles. I also love to have my own observations with whomever I have seen behaving well or behaving badly. And if I see someone famous at a public event, it’s fair game. Sure I’m looking for material. I mean, hell, when I go visit my 95-year-old alcoholic mom, I’m looking for material! LIW: How is she, by the way? GRIFFIN: She’s a living legend. She’s doing very well. She came to my show in Los Angeles two weeks ago. I sat her in the front row because she wanted to be near an exit. What does that tell you about parental support! It’s equally important to her that she have an exit strategy—like Colin Powell—as regarding my vitriol and that she’s near a bathroom. I actually handed her the microphone for a couple of minutes because the stuff that she says, you can’t even write it. It’s so genius. Yes, I have real moments with my mother, and then sometimes, you know, she’s in the act. That’s just how it is. LIW: Is she really an alcoholic? GRIFFIN: My dad passed away, but he lived to be 90. He had an incredible life. I’m hoping I have those genes. Until the last year of his life, he was incredibly healthy and playing golf and very social. He would come over to my house all the time and go to the movies with my mom. It was a great love story; they were married 65 years. Yes, I think the booze was flowing, and maybe it helped. I’m not here to judge. Wait, I’d like to retract that. I am absolutely here to judge. I love to judge. I love to judge unfairly. I have no qualms about judging people incorrectly or judging people I barely know. In fact, I’ve made my living doing it. LIW: Are there things you wish you hadn’t said? LIW: So she’s next on the curve? GRIFFIN: Well, I’m not predicting peoples’ demise; I’m just talking about fodder. I mention Demi Lovato because she’s a 23-year-old woman at the height of her fame, and she’s doing really, really well. But she does things that are funny and seems to have no sense of humor about them. That’s my perfect person to make fun of: someone who’s so big that there’s nothing I can do to hurt them in any way. But then she went on Twitter and tried to say that it was on purpose. I watched the tape, and she was clearly caught off-guard by the question. But I find that amusing. You’re 23 and wildly famous, but you’re gonna take to Twitter and defiantly say, “No, I was making a joke about mugs.” That’s the sort of thing that is perfect for my act. LIW: You began with The Groundlings doing improv, so in your early years as a comic, were you able to avoid the standard “isn’t airline food terrible?” material and go right to what you do now? GRIFFIN: When I started, I actually wouldn’t do comedy clubs because I never could do the airline-peanuts jokes. I started with more of a storytelling style. I always say to people, I couldn’t tell you a joke if you paid me. If people come up to me at airports and go, “You’re a comedian; tell me a joke,” I’m like, “Do you have 20 minutes?” `Cause I tell these long-winded stories that have jokes interwoven in them. And in the beginning, it wasn’t all about celebrities because I didn’t know any. Instead, it was about whatever was happening in my life. It was about my family or my dating history or whatever crazy guy I’d slept with the night before. Then, as I started working in Hollywood, the act became about pop culture and celebrities that I’d run into. Over the years, luckily, I’ve gotten to meet so many people that now, if you come see me on this tour, I could be talking about a politician that I met, or 18-year-old pop stars that I met, I could be joking about my friends, Anderson Cooper or Cher; I could have a new story about my mom, I could have a brand-new story about some event that I hosted or attended or presented at. LIW: Isn’t it the old cliché that stars should worry only when comedians stop paying attention to them? GRIFFIN: Maybe, but there are still plenty of people that hate me. The singer Lana del Rey was unhappy with me about a joke I made. And I didn’t even remember it! So it was funny when she confronted me. I was in the middle of thinking it was cool to meet Lana del Rey, and she was mad about some joke. But I never apologize for jokes. So I said, “Okay, I don’t remember saying that, but it actually does sound like something I would say.” And she was like, “Oh yeah, you said it.” And then I said, “Okay, well, I hear you.” I don’t apologize, but I say things like, “I hear you.” And then I always congratulate them. These people in my act don’t realize that I’m making fun of them, but I’m also a fan. They’re not mutually exclusive. LIW: Even in this day and age, only a comparative handful of women make a living doing what you do. Is this career path still much tougher for female than males? GRIFFIN: One of the things I struggle with is being a feminist, and growing up and loving my beloved Gloria Steinem, and being in such a male-dominated field. I don’t think people realize how much progress female stand-ups haven’t made. I’m 55 years old, and I’m really in a club of one. I’m kind of the only out there who’s doing stand-up at this level. I’m not in the Judd Apatow mafia, the Lorne Michaels boot camp, or any of that. People will go, “What do you mean women in comedy still have to struggle? I like Amy Schumer!” It’s great that you like Amy Schumer, but that doesn’t mean you’re done. I work out every day, and I just love it. I think it helps my state of mind. I really love them all. I’m not a comedy snob. But of course, I’m gonna say the women. I just get a kick out of all the girls out there doing their thing with the microphone. I have the most embarrassing rider of anybody: peanut butter (because it gives me protein before a show if I’m doing two shows in one night), water, diet soda, and a diet energy drink of some kind. If you could have one superpower . . .
To have the men in Hollywood—who are still signing the checks and making all the ultimate decisions—see me as an equal. Have them see me based on what I bring to the table talentwise and not just as a 55-year-old woman. I go hiking every day, and I just love it. I don’t bring my phone. It’s a time to just be outside. If I’m on the road, I’ll go for long walks wherever I’m playing. If I’m in New York, I’ll just walk the city. I’m like Forrest Gump; I go on long walks every day.